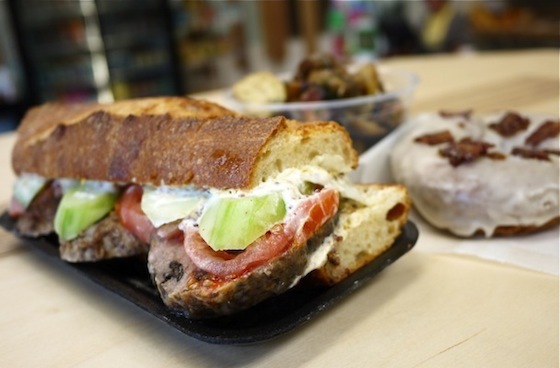 Looking for a quick lunch or grocery store on Commercial? Woodland Smokehouse has pretty much everything you could want. As I neared the end of Commercial, I thought I’d missed it. Pulling over, I noticed a large building with cute pin style logos and text on the front window: ‘Made in House, Smoked in House, Baked in House’. This was it! I entered to the thick scent of smoke and Chef Anatoli Belov slicing fresh-from-the-oven Jalapeno Sausage Rolls. Their quilts of pastry were noticeably soft and supple. Woodland Smokehouse and Commissary is a massive food production facility with an awesome retail storefront. Just steps inside and you’ll brim with dinner ideas. They’ve got pot pies, lots of pate, pickled just-about-anything, and much, much more. Takeout lunch options are endless, too. My Turkey Cranberry Pate sandwich was absolutely bulging with slices of savory paste. The thick bread was hard to eat but the insides were thickly lubricated with butter and grainy mustard. To finish, a Bacon Bourbon or Earl Grey Cartems Donut — best described as ‘otherworldly’ — is imperative.